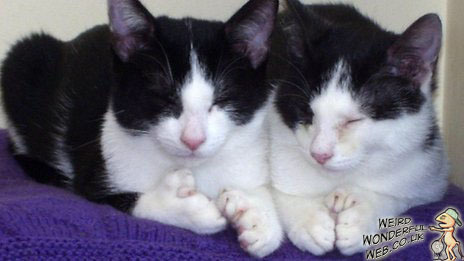 Weird Wonderful Web: Two kittens - eighteen toes! Two kittens - eighteen toes! Two polydactyl kittens with 18 extra toes between them. This pair of four-month-old kittens were found to be quite unusual. The kittens were handed in to a branch of Cats Protection in Gosport Town, Hampshire, England. It immediately became apparent that they were both polydactyl. This term is used when a cat has extra digits on its paws. Usually one extra on each paw, but a couple more on each paw is also seen. Normal cats have five toes on their front paws and four toes on their back paws, but these two kittens, named Ned and Fred have an extra eighteen toes between them. Ned has eight extra toes and Fred has ten extra. Karen Hiestand a Cats Protection field veterinary officer said that Fred's extra toes were an "extreme case". But also added that "the extra toes did not affect the health of the kittens". Looking for love? Try the wanted ads. This Valentine's buy her a crash helmet!